There's all to play for in the upcoming Game of Thrones Season 8, and it's the same with these fantastic POP! 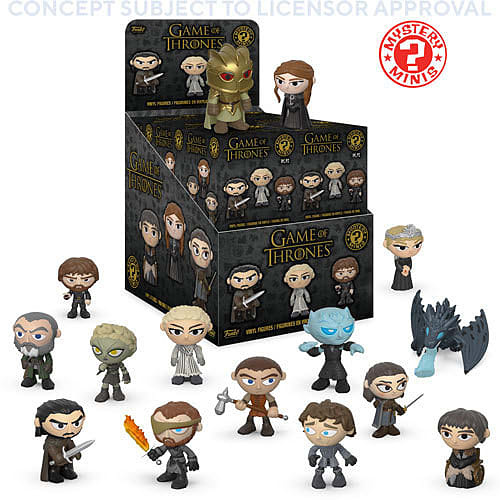 Game of Thrones Mystery Minis. Including some of the nations favourite characters such as Daenerys, Viserion and Tyrion, these mystery minis give an adorable take on the cut throat world of Westeros. Sure to be the crown of your Game of Thrones merch collection, don't miss out and shop the POP! Game of Thrones Mystery Minis today, at GAME. Please Note: POP! Vinyl Mystery Minis are blind boxed assorted figurines. You will only receive one, randomly selected blind box mini POP! Vinyl. "When you play the Game of Thrones, you win or you die." - Cersei Lannister. Who will be left sitting on the Iron Throne when season 8 has concluded?